Detective Sergeant John Spartan, also known as the ‘Demolition Man‘, is awakened from cryo-sleep in the year 2032 to a world which has radically altered. After the great earthquake of 2010, the new city of San Angeles has been built into a strange totalitarian utopia ruled over by the sinister Dr. Raymond Cocteau. In this artificial, sanitised society of the future the people live in a state of ineffectual ignorance, and are thoroughly unequipped to deal with an escaped mass murderer who is now on the rampage. Spartan is re-enlisted to deal with the crisis, but as he investigates the case, he discovers there is more to this regime than initially meets the eye. 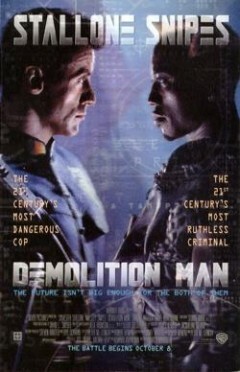 What makes Demolition Man a Dystopia? Lenina Huxley: Now all restaurants are Taco Bell. This heavy handed approach extends all the way to outlawing swearing. That would do it. But wait, there’s more! As John Spartan discovers, there is a hidden group of people who reject these principles and are consequently excluded completely from society, denied access to food, and generally regarded as less than human. This creates a distinct two-tier social structure, somewhat reminiscent of H. G. Wells’ ‘Time Machine’ with the Morlocks and the Eloy. This forceful protection of the population from anything deemed dangerous, has created a world full of ineffectual, naive ‘innocents’, with severely undermined capacity for self-determination or ability to deal with unexpected circumstance. This creates a kind of ‘downward spiral’ where the city’s leader has to go to increasing lengths to protect the population from the ever-impending encroachment of external reality. This starts with denying contact from the outside world, and eventually ends with the secret recruitment of mass murderer Simon Phoenix as a hired mind-programmed assassin to kill the impromptu leader of the disenfranchised underclass. Moral Statute Machine: You are fined one credit for a violation of the Verbal Morality Statute. Benjamin Bratt as Alfredo Garcia in Demolition Man: [confused] "Did... did you say toilet *paper*?" Denis Leary as Edgar Friendly in Demolition Man: "That's right. You see, according to Cocteau's plan. I'm the enemy. Because I like to think, I like to read. I'm into freedom of speech, freedom of choice. I'm the kind if guy who would sit in the greasy spoon and think 'Gee, should I have the T-bone steak or the big rack of Barbecued spare ribs with the side order of gravy fries?' I want high cholesterol. I want to eat bacon, butter and buckets of cheese alright?" Sylvester Stallone as John Spartan in Demolition Man: "Somebody put me back in the fridge." Sandra Bullock as Lenina Huxley in Demolition Man: "Ahh... smoking is not good for you, and it's been deemed that anything not good for you is bad; hence, illegal. Alcohol, caffeine, contact sports, meat... "
Nigel Hawthorne as Raymond Cocteau in Demolition Man: "Well I must say that whacking, whatever it is, sounds most disagreeable." Wesley Snipes as Simon Phoenix in Demolition Man: "Wait a minute, this is the future. Where are all the phaser guns?" Christian Bale as Bruce Wayne in The Dark Knight Rises: "I do fear death. I fear dying in here while my city burns." John Hurt as Adam Sutler in V For Vendetta: "I want this country to realize that we stand on the edge of oblivion. I want everyone to remember why they need us!" Warren Clark as Dim in A Clockwork Orange: "Yarbles! Great bolshy yarblockos to you. I'll meet you with chain or nozh or britva anytime, not having you aiming tolchocks at me reasonless. Well, it stands to reason I won't have it." Gustav Frohlich as Freder in Metropolis: "I wanted to look into the faces of the people whose little children are my brothers, my sisters... Your magnificent city, Father - and you the brain of this city - and all of us in the city's light... And where are the people, father, whose hands built your city ---?" Gina Torres as Zoe Washburne in Serenity: "Jayne, we're robbing the place, we're not occupying 'em." Belinda McClory as Switch in The Matrix: "Not like this... not like this." Jewel Staite as Kaylee in Serenity: "Sometimes people have feelings... I'm referrin' here to people." Uma Thurman as Irene Cassini in Gattaca: " 'Unacceptable likelihood of heart failure.' I think that's what the manual says. The only trip I'll take in space is around the sun on this satellite right here.